What? There's another Hanji center in Korea? Let me spell it out for you : W-O-N-J-U. On a chilly Saturday morning my husband and I left Iksan to go explore the city of Wonju, in the province of Gangwon-do (northeastern corner of South Korea). We hit the road at 5:30am, expecting that our journey to Gangwon-do would take five hours or more. Surprisingly, barely two and a half hours later we were arriving in Wonju. The Festival site was very spacious, unfolding all over the parking area and lawn of the very nice and modern Hanji Theme Park Center. 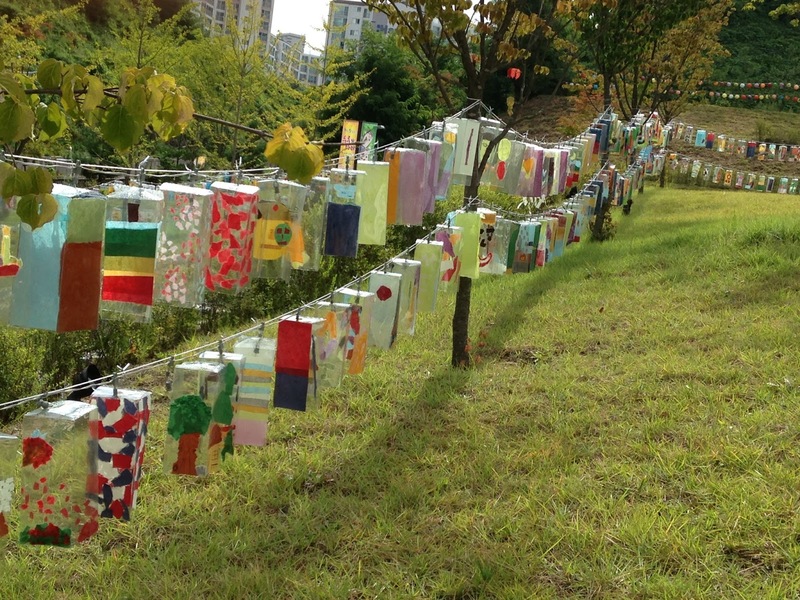 Hundreds of lanterns, made by Korean school students, were hung all around the perimeter of the Festival site. The long strings of colorful lanterns gave a wonderful feel of craftiness to the site, and really created atmosphere. I also suspect that the presence of those lanterns naturally increased the flow of visitors, as the little Hanji creators were probably eager to show their work to their parents or relatives. That's a very smart PR move! A lot of attention was paid to make the Hanji paper itself the true star of the Festival. 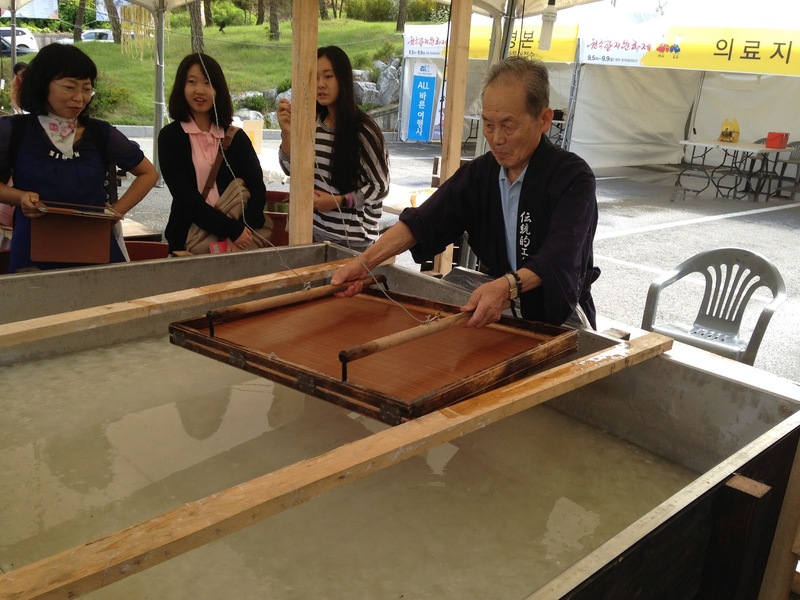 Several Hanji making stations were set up in the center of the site, so people could experiment first hand with the paper making process. 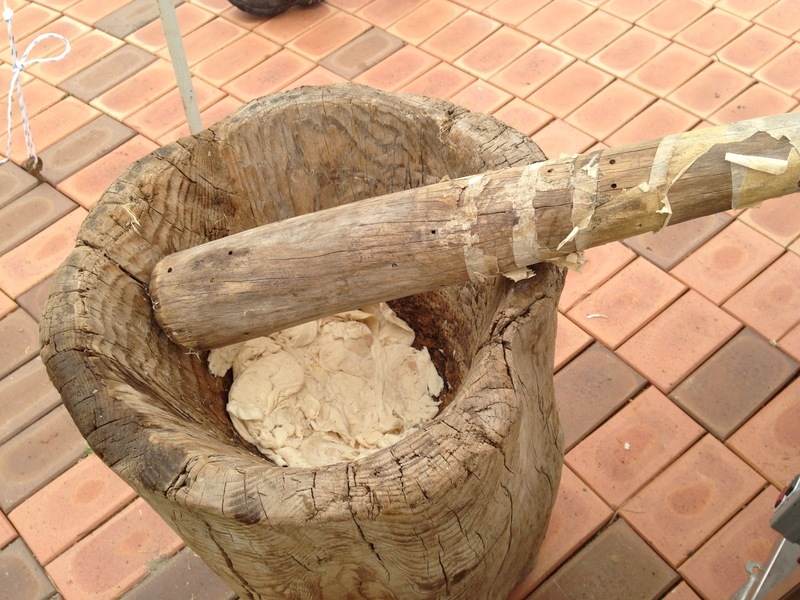 Six tubs with different colors of mulberry pulp were set up for the visitors to try making their own sheet of Hanji paper. 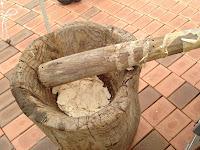 The raw materials and traditional tools were also on display, so people could really get a good idea on how the paper is made, from start to finish. 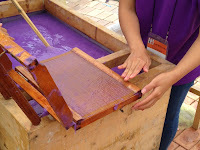 They could see the mulberry pulp at different stages in the process, the large wooden tub where the pulp is stored and the shallow bamboo or wooden baskets used to create every single sheet of Hanji paper. 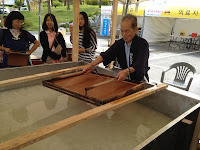 There was also a Japanese master who was demonstrating the art of paper making, according to the Japanese tradition. 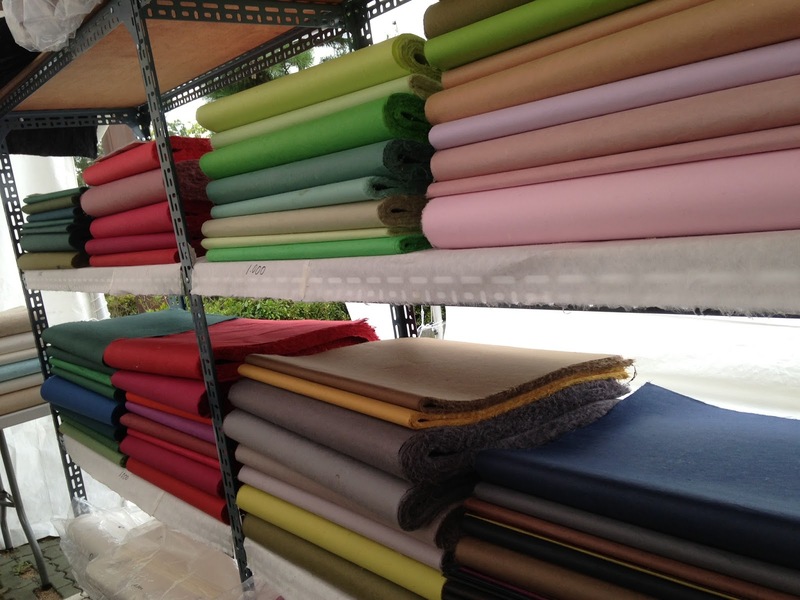 It was fascinating to see him make those perfect silky sheets of paper with incredible ease. Evidently, he manages to make, by hand, up to 200 sheets of paper a day. Among the many vendors on site were several Hanji paper sellers, offering for a very good price the high-quality Hanji made in Wonju. 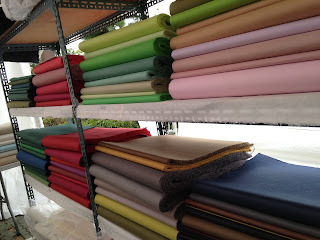 No need to say that I had a blast shopping for new colors and patterns! I was delighted to find some unusual papers, including a wood-grain patterned Hanji. 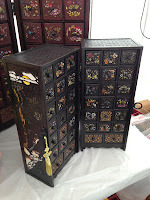 There were only a few booths displaying the work of Hanji artists, but those who were there had stunning pieces to present. I had the great pleasure to meet Mi-Sook Choi, a Hanji artist based in Wonju. Her booth was filled with fantastic items, such as boxes, pen holders, lamps, cabinets and other intricate objects. 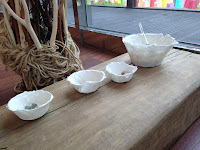 Mrs Choi has a workshop and boutique in Wonju. She was very friendly and took the time to explain the different techniques she has developed through the years. We talked about patterns, color choices and inspiration; it was marvelous to be able to exchange with a person who shares the same passion for Hanji crafts. I left Mrs Choi's booth excited and reinvigorated. But, a few minutes later, I have to admit that I started to struggle with self-doubt. The view of such stunning work made me feel a little self-conscious, and made me wonder if I would ever reach that level of achievement and craftsmanship. The vibrant color combinations, the sharp cutting work and the delicacy and taste of the pieces I had seen left me humbled... Luckily, in the same time, it gave me the desire to get to work! It gave me ideas, sparked my interest for certain designs or patterns I hadn't really pondered before, and most importantly it got me excited! their touch to a very large mural. A Hanji Festival would not be complete without some hands-on activities. 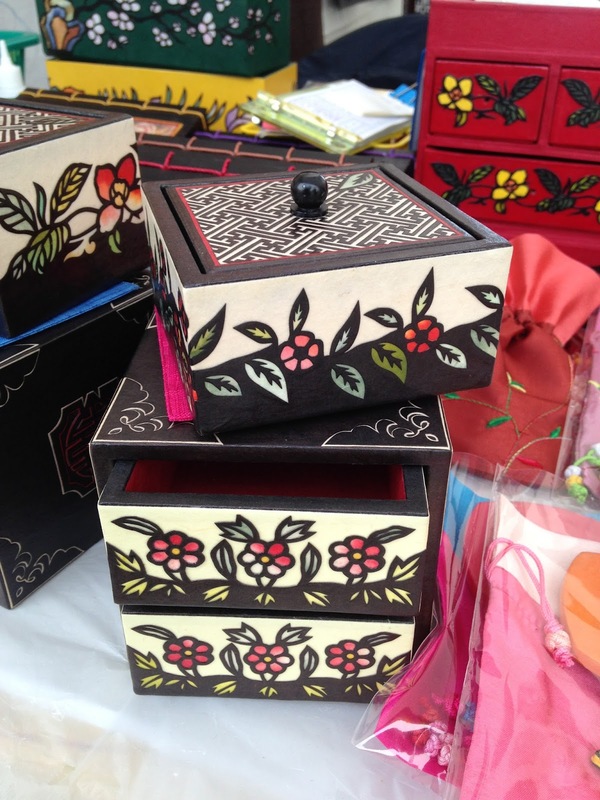 The Wonju Festival offered to visitors to change to make their own sheet of Hanji paper, but also to make different objects using Hanji : containers, jewelry, pinwheels, lamps, etc. The tiny visitors were also invited to put their own personal touch onto a gigantic mural that was hung by the entrance of the Hanji Theme Park building. I thought it was a very creative way to involve children, without forcing them to sit down at a table for a long period of time. a practice sheet that erases itself! 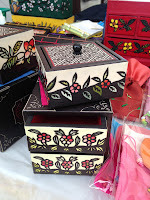 Some other traditional Korean crafts, including traditional calligraphy and embroidery, were also present at the Festival. There was even a candle-making workshop. I had the chance to meet a calligraphy master, who had this magical practice board for sale : when the wet brush touches the paper, it turns black (when in contact with water). Once the paper dries, it returns to its original white color! How clever! It's a wonderful tool for practicing strokes, without wasting precious paper or ink. The Hanji Development Institute, founded in 2001 in Wonju, has the mission to promote the growth of Korean culture and art using Hanji. For this purpose, a very nice and modern Hanji Theme Park was recently built in Wonju. 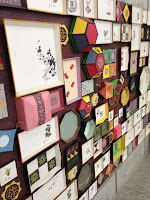 This center is dedicated to Korean Hanji paper, its artists and its promotion around the world. A very nice building welcomes visitors with permanent exhibits on the history of Hanji, a nice boutique offering for sale a wide range of Hanji products (including clothes, household items, lamps, cabinets, boxes, coasters, etc.) and several rooms designed to welcome workshops and training sessions. An information counter also offers documentation on the Hanji Theme Park, as well as the Wonju area. 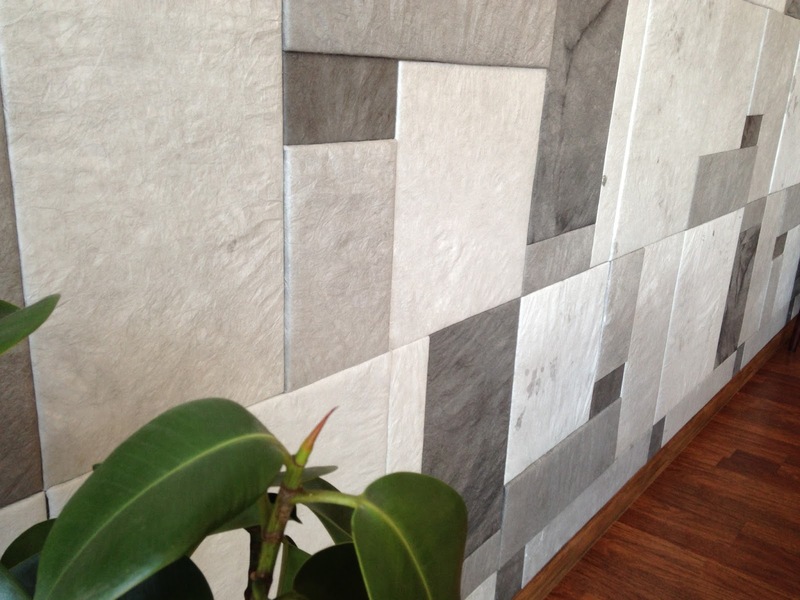 A Hanji wall, inside the Hanji Café. 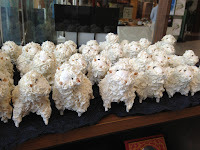 displayed in the Hanji Café. There is also a very cozy coffee shop, called Hanji Café, where visitors can enjoy a cold or hot drink, in a very artsy atmosphere. I was particularly impressed with the Hanji brick wall and the beautiful artwork displayed in the Café. 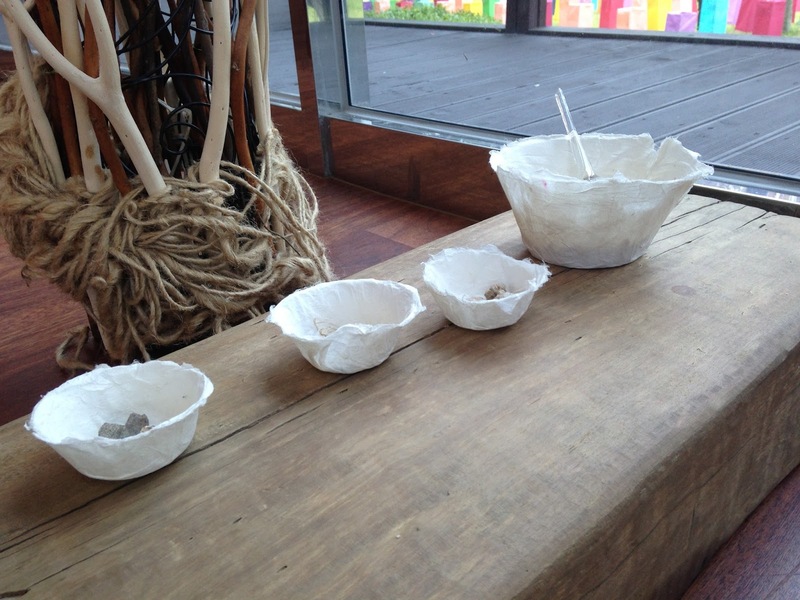 Many stylish Hanji items gave charm to the coffee shop (including some Hanji paintings, paper lanterns and paper sculptures). Personally, I think they could take the theme a little further and make sure that the napkin dispensers or the coasters were made of Hanji, so visitors can appreciate the utilitarian objects as well as the pieces of art. 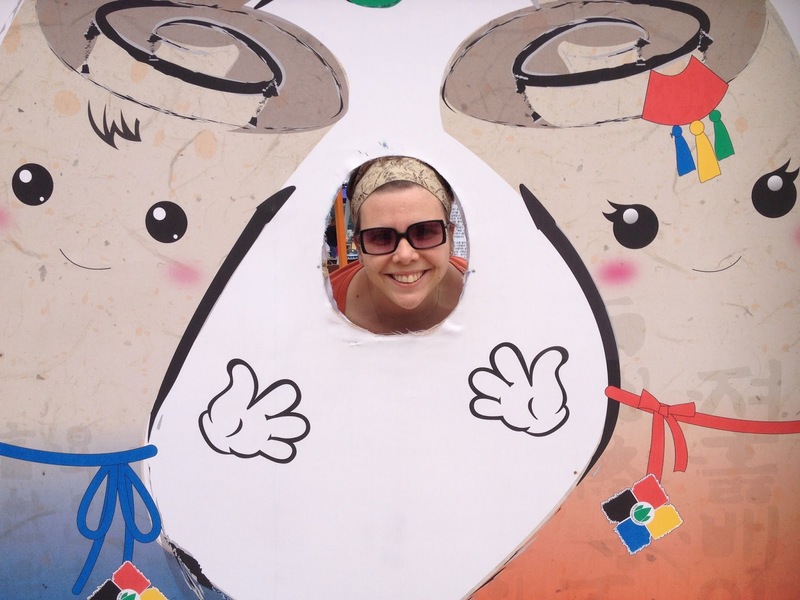 I was pleased to see quite a few foreign visitors at the Wonju Festival. 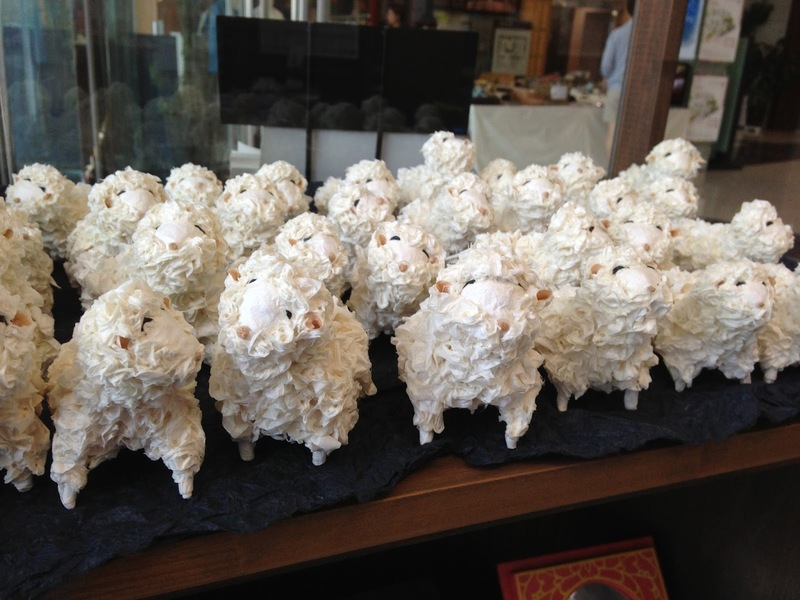 I was glad to see that foreigners were showing an interest for this traditional Korean craft that truly owns my heart. I have to salute the Festival's effort to produce a very nice bilingual program : the English texts relating the History of Hanji, the different types of crafts and were very comprehensible and well written. Unfortunately, I have once again to whine about the fact that the Festival website is solely in Korean, and is difficult to navigate. And why on Earth is the website of the Hanji Development Institute, dedicated to the International promotion of Hanji crafts and artists, only in Korean? Doesn't this defeat the purpose? Overall I had a wonderful time at the Wonju Hanji Festival. It was a very pleasant experience, filled with meaningful encounters, inspiring materials and a very friendly atmosphere. You can be sure that I will be there for next year's edition! I don't think I will be able to participate in the Festival per se (the schedule and distance would make it difficult for me), but I'll surely attend as an enthusiastic visitor and Hanji lover! Wonju, you've got a new best friend!